Hanneke Van Lavieren from the Netherlands, was born and raised in Africa and Asia. 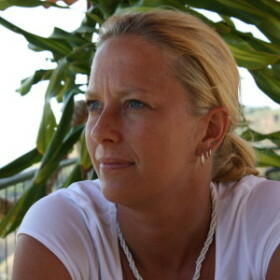 She completed her Master’s degree in Marine Biology and Ecology in 1997 at the University of Groningen and has 17 years’ work experience in designing, implementing and coordinating a diverse portfolio of complex and multi-faceted projects in the field of marine conservation and protection at the national, regional and global level. She began her career as a Fisheries Biologist for the Netherlands Institute for Fisheries Research where she studied catch composition and population dynamics of target and non-target fish species in the Dutch beam trawl fishery and alternative fishing methods to reduce by-catch. Longing to return to the tropics, she took up a position as Marine Technical Advisor for a conservation project in the Philippines for the Netherlands Development Agency in 1999. Here she worked closely with local communities, conducted extensive coastal monitoring and training activities, and developed an integrated coastal management plan. In 2001, she moved to Kenya to join the UNEP Regional Seas Programme, where she worked closely with governments to address environmental challenges and priorities within the international policy framework and to develop initiatives on a suite of coastal management issues. From 2006-2014 Hanneke worked for the Coastal Programme of the UN University Institute for Water Environment and Health in Canada, where she developed and managed a diverse portfolio of projects in tropical coastal regions around the world. From 2012 she served as Regional Coordinator for the Latin America and Caribbean region and was responsible for implementing projects addressing a wide range of coastal management issues in this region. Since October 2014 she is a freelance conservationist and runs an Environmental Consultancy (Blue Eco Services) specialising in ecosystem based, ridge-to-reef marine conservation approaches linking sound science to the formulation of policy for improved coastal management, while focusing on capacity enhancement and community-based conservation. She is a certified Rescue Diver with 16 years diving experience in tropical and temperate regions and is passionate about the underwater world. Hanneke’s main areas of experience are in project/programme development, capacity building, coral reef management; MPA design and spatial planning; reef fisheries management; mangrove ecosystems; small islands; climate change resilience and adaptation; coastal risk reduction; marine biodiversity and coastal pollution. Hanneke has worked in many countries in the Caribbean, Meso America, South and East Asia, Middle East, Northern Europe, and East Africa regions. She has worked with Wetlands International since 2015.